They’ve been alive and kicking for 60 years. Founded at the beginning of the 1958/59 season, Dromore Amateurs Football Club have kept ‘the beautiful game’ going in their home town for six decades. 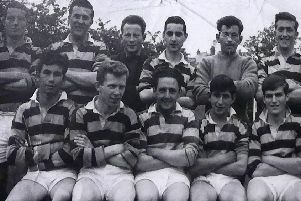 To mark this historic milestone, the Mid-Ulster Intermediate League club is holding a 60th anniversary dinner next month at the Millbrook Lodge Hotel in Ballynahinch. It’s hoped that former players, managers and committee members will come along and help celebrate this landmark occasion. Keeping a football club on the road is no mean feat – let alone for 60 years! Mr Ward paid tribute to all those who have played their part – large or small – in ensuring Dromore Amateurs have kept going, season after season. “Our success is thanks to the hundreds of people who have played for the club over the years, the managers, committee members, sponsors and other unsung heroes who have helped out in the background. The past is a source of pride, but the future is cause for excitement for the men in amber and black, whose home ground is Ferris Park. “We’re an ambitious club,” said secretary William McMurray. “We’ve a great young player-manager in Graeme Davis who is having an excellent first season in charge of the first team in Mid-Ulster Intermediate B. “We’re also busy developing plans for our own pitch and clubhouse. And Dromore Amateurs Youth is a great set-up run by some dedicated people, and has brought many young players through into the senior teams. The anniversary dinner in the Millbrook Lodge Hotel, Ballynahinch, takes place on Saturday, April 27 at 7pm. It promises to be a wonderful occasion for old football colleagues to meet and reminisce about past glories. Laughs aplenty will be provided by the after-dinner speaker – legendary NI sports personality Jackie Fullerton. The dance floor is sure to be packed thanks to live music by five-piece band Klass. There will also be an auction of sporting memorabilia where one of the items – a football signed by the current title-chasing Liverpool squad – will likely spark a flurry of bids. Tickets cost £30. Anyone interested in attending can contact William McMurray on 07706019953 or contact the club via its Facebook page.